A tricky question has been keeping economists busy of late: Are Japanese consumers finally beginning to loosen their purse strings? As far as recent economic data show, the answer may be yes — at least for now. 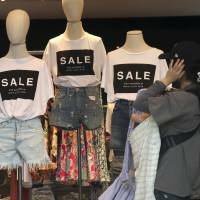 Private consumption, accounting for nearly 60 percent of Japan’s economy, rose 0.9 percent in the April-June period in real terms following five quarters of modest growth at between 0.1 percent and 0.4 percent. It’s an encouraging sign of strengthening domestic demand. Sales of durable goods, ranging from cars to electronic appliances, have been picking up, while consumer sentiment has been aided by stabilizing prices for fresh food. Still, many economists have yet to conclude whether strengthening private consumption is transitory or is set to continue and pave the way for a period of growth — powered by increasing domestic demand in which both consumers and companies step up spending. “I can’t say private consumption will enter negative territory (in the country’s GDP data), but for now I can’t think of good reasons why the pace should continue to pick up,” said Toru Suehiro, senior market economist at Mizuho Securities Co. Sluggish consumption has been a headache for policymakers and economists, complicating efforts by Prime Minister Shinzo Abe and the Bank of Japan to lift the economy out of years of deflation. 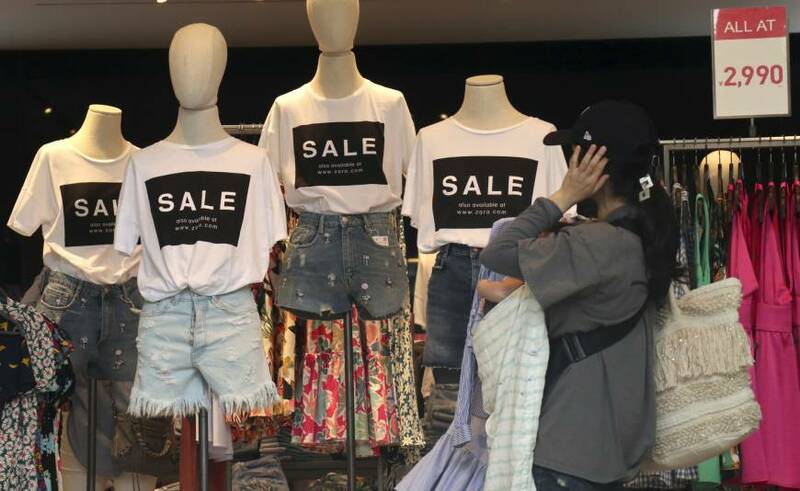 But consumption has been given a boost this summer, as some retailers appear to be reaping the benefits of the scorching heat. “It’s extremely hot this summer and we’ve seen strong sales of air conditioners, with revenue doubling from a year ago,” a home appliance retailer said in a recent government survey. Higher temperatures and longer hours of sunshine than are seen in an average year are also thought to have helped stimulate demand for a wide range of products as well. “But it will not continue forever, so things will likely deteriorate somewhat,” the home appliance retailer said. The uptick in demand for durable goods also indicates that the time has come for many consumers to trade in old items nearing their replacement cycles and purchase new ones, according to some economists. Whether consumers will continue to spend money in the coming quarters is critical, as the Japanese economy — now in its third-longest expansion phase in the postwar era — looks on course to exceed the 57 months of growth seen during the Izanagi boom between 1965 and 1970. According to the BOJ, the seasonally-adjusted consumption activity index for the April-June period marked the highest growth rate on quarter since the first three months of 2014. That was before the consumption tax rate was raised to the current 8 percent from 5 percent. Abe, urging companies to raise pay, has boasted that employment conditions and income have been improving under his policy mix known as Abenomics. But economists generally agree that wage growth needs to accelerate further to boost consumption, as uncertainty about the future and on issues such as swelling social security costs persists. This year, summer bonuses at major Japanese companies fell for the first time in five years. They averaged ¥878,172, down nearly 3 percent from a year earlier, data compiled by the Japan Business Federation showed. “Real wages have been more or less flat in recent months, which wasn’t much of a headwind or a tailwind,” said Yuichiro Nagai, an economist at Barclays Securities Japan Ltd.
Nagai expects the nation’s consumption to slow in the July-September quarter after strong growth and as real wages will likely fall. “That said, if the so-called ‘heat wave’ effect remains, it’s possible that both the household and corporate sectors will have done well after all,” Nagai added. With job availability at an over four-decade high, policymakers and economists say such tightness in the labor market should lead to higher wages as companies are in an increasingly intense hunt for workers. The number of people aged between 15 and 64 who prefer not to work has been on a downtrend, a sign that labor participation has been increasing. In addition to higher wages, there is optimism that the country’s labor shortage could also encourage companies, hoarding cash amid worries about business prospects, to step up investment in automation and equipment to streamline operations to save labor. The government, for its part, has warned that the labor shortage could become a bottleneck to economic growth at a time when the country’s population is rapidly aging. Laying the solid foundation for longer-term growth, driven by vigorous private consumption and capital expenditure, remains an ongoing process. “We are at a juncture where we need to see whether the economy can get a sustainable boost from domestic demand,” a senior government official said. “What is needed is an additional push” in helping reduce uncertainty over the future outlook, the official added.